Not the way you’d expect to describe a band called The White Swan, but one listen to the Canadian trio’s debut EP, Anubis, and the muddy picture becomes clear. 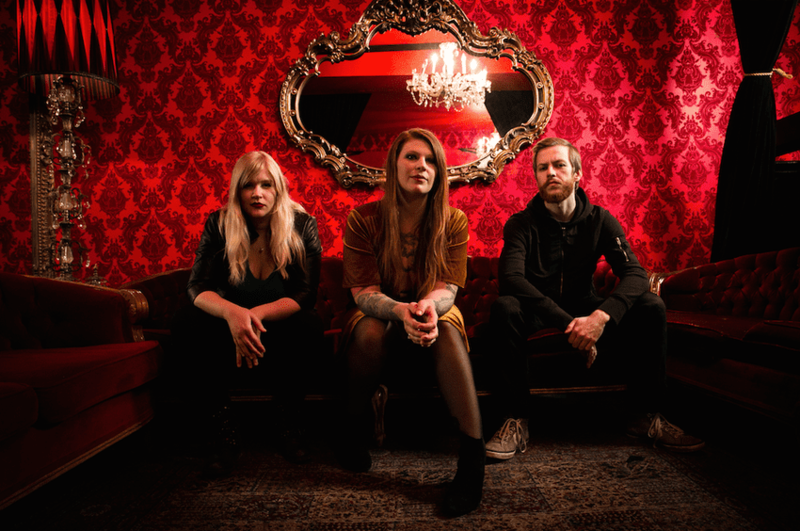 Launched by drummer turned vocalist/guitarist Mercedes Lander (Kittie), The White Swan bleeds warm ’70s flavoured Black Sabbath doom mixed with classic ’90s grunge, creating a trademark sound within the space of only three songs. Backed by Kira Longeuay (bass) and Shane Jeffers (guitars), Lander’s previously unknown vision for her music has taken on a life of its own and has been met with praise by the open-minded legions of the rock and metal community. Named after the T-Rex song, The White Swan‘s debut boasts two original songs and a cover of the Wings classic “Jet”, penned by Paul McCartney of The Beatles fame. The band makes no secret of the fact Lander is the principle songwriter but she is far from being a dictator, preferring to view The White Swan as a team effort. “If Kira or Shane came to me tomorrow with what they feel is an awesome riff, I’d be all into doing something with it,” says Lander. Making it clear The White Swan is by no means a shot in the dark. With a string of live dates under their belts already and enough songs for a full album waiting to be recorded, the trio is poised for the long haul. They don’t have visions of grandeur, but rather a focus on making The White Swan an instantly recognizable name in a very busy and often cluttered rock world. And while their new fans are waiting expectantly for a new album, Lander and her bandmates have a much more realistic view of their future as newcomers on the scene. Anubis was recorded in a mere 10 hours, boasting a live-off-the-floor feel in grand ’70s tradition even though it was assembled with present day digital technology. Lander recorded all the drums, teaming up with Jeffers for the guitars before overdubbing and layering at the hands of producer …. The tracks “Blood” and “Illuminate” establish The White Swan sound out of the box, and “Jet” makes a huge impression in that many people don’t realize it’s a cover. Anubis was a case of learning by doing, and The White Swan will kick off 2017 with a trip back to the studio to record a new EP which they expect to complete in a day. From there, Lander expects the band will continue to refine their live set, which is an integral part of their existence given how quickly they pushed their way to the stage.